Screws included. Projection 2-5/16" lower hook, 2-15/16" upper hook, base 1-9/64"H x 1-23/32"W. Polybagged. Screws included. Projection 2-5/16" lower hook, 2-15/16" upper hook, base 1-9/64"H x 1-23/32"W. Polybagged. 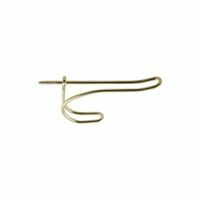 For use where a single hook or a series of single hooks is desired. Add a decorative accent to any room. Includes fasteners for quick and easy installation. For use where a single hook or a series of single hooks is desired. Add a decorative accent to any room. Includes fasteners for quick and easy installation. For use where a single hook or a series of single hooks is desired. Add a decorative accent to any room. Includes fasteners for quick and easy installation. Ideal for use in bedrooms, bathrooms, closets, and foyers. With screws - polybagged. Screws included. Projection 2-5/16" lower hook, 2-15/16" upper hook, base 1-9/64"H x 1-23/32"W. Polybagged. For use in bedrooms, bathrooms, closets and foyers. 2-7/8" upper hook projection. Includes fasteners for installation. For use in bedrooms, bathrooms, closets and foyers. 2-7/8" upper hook projection. Includes fasteners for installation. For use in bedrooms, bathrooms, closets and foyers. 2-7/8" upper hook projection. Includes fasteners for installation. 1-3/4"H x 2-3/4"W. Hole diameter 5/32". Screws included. 1-3/4"H x 2-3/4"W. Hole diameter 5/32". Screws included. Screws included. Projection 2-5/16" lower hook, 2-15/16" upper hook, base 1-9/64"H x 1-23/32"W. Polybagged. 1-3/4"H x 2-3/4"W. Hole diameter 5/32". Screws included. Screws included. Projection 2-5/16" lower hook, 2-15/16" upper hook, base 1-9/64"H x 1-23/32"W. Polybagged. 1-3/4"H x 2-3/4"W. Hole diameter 5/32". Screws included. Screws included. Projection 2-5/16" lower hook, 2-15/16" upper hook, base 1-9/64"H x 1-23/32"W. Polybagged. 2-1/3" depth for large hooks, 1-7/8" for smaller hooks and 3-5/16" overall height. 13/64" hole spacing. Screws included. 1-3/4"H x 2-3/4"W. Hole diameter 5/32". Screws included. Economy handrail Includes screws. 3-1/4" projection. 2-15/16" base height. 3/4" x 2-3/8" clip. Accommodates 7/8" handrail. Polybagged. 1-3/4"H x 2-3/4"W. Hole diameter 5/32". Screws included.